A little while ago we received some goodies from GOSEN to review. Among the goodies are a trio of Customedge rackets, the Type V, Type X, and Type S.
The Gosen Customedge is the new top of the line racktes from Gosen. The Type S that we will look at in this review lies in the middle of the pack range, with a 88g weight, middle balance, and regular flex. First let’s go through the mechanic and aesthetic of the racket. 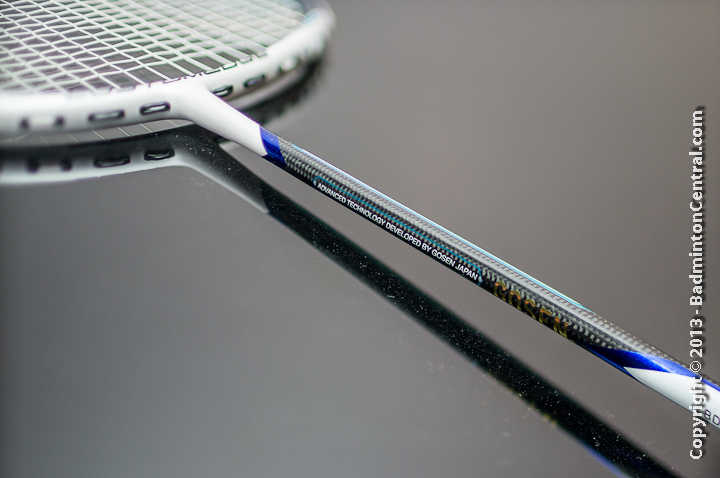 The Customedge Type S brings Gosen back to its classic range of oval shaped racket. 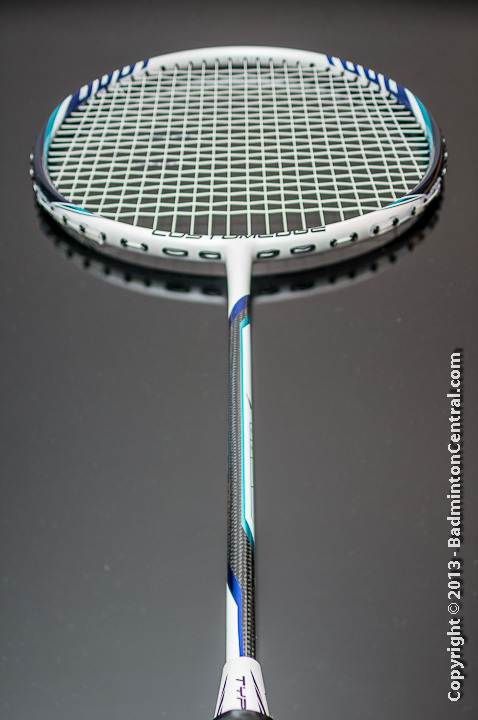 Releasing an oval headed racket is refreshing among all the almost standard Isometric head market out there. As many have read in our classic “cab explosion” thread in Badminton Central, oval head packs a solid punch that is hard to find in many Iso rackets. The particular oval shape reminds me of the classic Carbonex shape, with a slightly fatter top that makes it almost elliptical. As with many oval rackets, it is accompanied by the also classic 72 holes pattern. The quality of the grommet is decent but not top of the line. Extra rubbery grommet strip is use in the 4/8 o’clock position, which is kind of interesting as it main bufers the side main strings which are hardly the worker string on a racket. 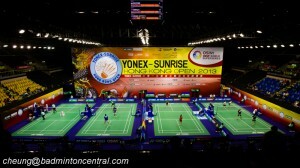 The Customedge series refers to a line of rackets that has a aerodynamic cross section head shape, not unlike the Yonex Aerotus series of old. And it is very apparent from holding the racket. The bottom part of the racket near the T is slightly more “sharp” than the top. 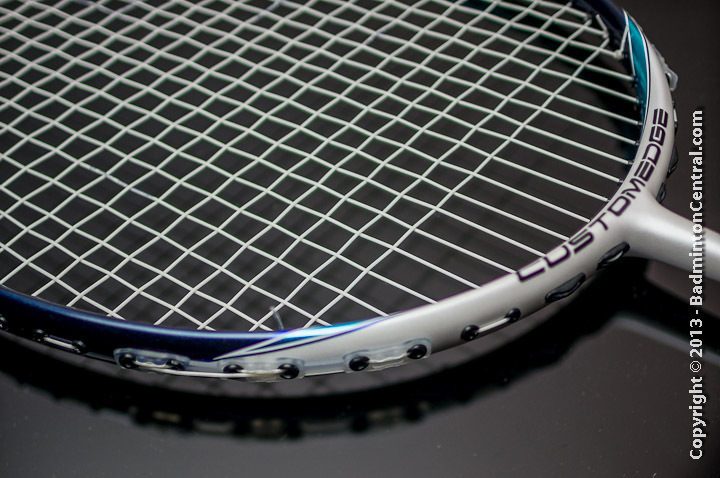 The overall motif of the racket is a white base racket with blue accents. The top and T are white broken by a bands of blue patterns on the 3/9 o’clock, while the middle of the shaft reveals something very interesting: woven carbon fiber. 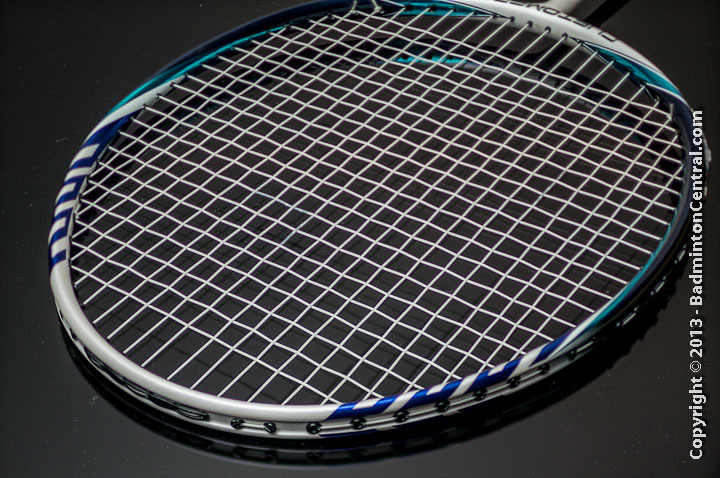 Interleaved with the woven layer is the printing of the brand and model name, 90 degrees off from what we normally expects, as well as the specs of the racket: 88g, 675mm length, middle balane, and regular flex. The recommended tension is 20-25lbs, probably slightly on the conservative side. What is surprising is that the review copy we received tips our calibrated digital scale at 92.5grams, grossly off the 88g spec printed in the racket. The balance came in at a moderate 288mm. Future buyer beware when you pick up your racket from the store as there may have been others which escaped the QA process. Stringing the racket was a breeze with the standard and familiar 72 holes pattern. Despite being rated regular flex it showed little deformation when strung with our standard Zymax 65 string @ 24lbs tension. Starting with some driving drills, the Customedge S is surprisingly maneuverable despite the mid 2U weight. the 288mm balance certainly helps a little in that regard. Directional control is surprisingly good and deflection of the racket is medium but predictable. 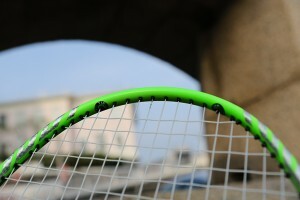 Torsional deflection is unnoticable, this racket is very stable despite the smaller sweet spot. Having said that though, it is by no mean fast. In modern day’s term, a 92g won’t cut it anymore when it comes to speed, regardless of the balance point. The swing weight is just too high. Defense then as a result, is a bit compromised. It is no problem to defend against the regular mid level club players, but the strain is definitely there and it quickly falls apart when the hard smasher walks into the court. Aided by the medium stiff shaft, clears are very crisp and solid on impact. Repulsion/Resilience is good. It takes a bit of effort on smashing but once it gets up to speed, the impact on the shuttle is a solid “boom” sound. The repulsion is lively which is one of the major winning point of the Customedge S. I am attributing that to the woven shaft which has been proven over and over again in many other models. 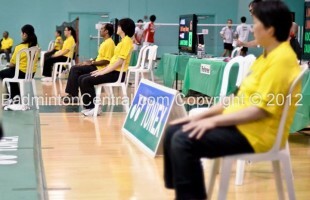 The explosiveness is also enhanced with the oval head shape. On full power jumpsmashes that lands right on the sweetspot, I can really feel the power being concentrated on the shuttle. The feeling on net shot is also quite excellent. There is only small amount of dampening which means I can feel the shuttle very well. It is also well controlled so there is no signs of unwanted vibration. Push and control is thus very good. This is the first Gosen racket that I have tried in many years. And overall I am quite impressed with the performance. It blends modern design and material with a traditional oval shape. This is a keeper for sure.